Sepsis is the most preventable cause of death and disability in Europe. According to the Global Sepsis Alliance, more than 3.4 million individuals develop sepsis every year in the WHO European Region, and 700 000 of these patients do not survive. An additional one third of survivors die within the following year, and many face lifelong consequences, such as physical, psychological and cognitive challenges. The financial burden due to sepsis has been calculated to be more than US$ 24 billion, representing 6.2% of total hospital costs in 2013. Studies in Europe and Canada estimated the daily costs of hospital care of a septic patient to be between €710 and €1033 in 2000 (equivalent to about US$ 645 and US$ 939, respectively). On Hand Hygiene Day, observed annually on 5 May, WHO calls on health facilities to prevent health care-associated sepsis through hand hygiene and infection prevention and control (IPC) action. By working together to each play our part, we can prevent sepsis and save millions of lives every year. The first step to stopping sepsis is implementing measures that prevent infections from occurring. The second is preventing infections from evolving into sepsis. In both communities and health-care facilities, this requires early detection of sepsis signs and symptoms and appropriate antibiotic treatment. In health-care settings, sepsis may result from health care-associated infections. This makes it all the more important for health workers to practise good IPC measures, including effective hand hygiene. Washing hands properly prevents infections and, in turn, reduces the risk of sepsis in health-care facilities. patient advocacy groups: “Ask for 5 moments of clean hands to prevent sepsis in health care”. It is also vital to ensure that health workers can recognize, diagnose and rapidly treat sepsis. Despite its tragic impact, sepsis is frequently underdiagnosed at an early stage when it is still potentially reversible. The evolution of an infection to sepsis can be prevented through early detection of the signs and symptoms, followed by prompt medical care and especially treatment with appropriate antimicrobials. This is crucial to increasing the chances of surviving sepsis. In the case of antimicrobial-resistant infections, which are becoming increasingly common, a patient’s condition can deteriorate rapidly, further underscoring the need for early diagnosis. It is possible to envision a world free from sepsis, but this vision will only become a reality through concerted action taken by a range of actors. 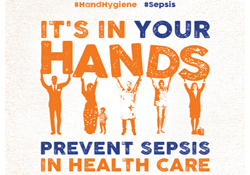 On Hand Hygiene Day, it is time to collectively commit to raising awareness about the proven approaches to preventing infection, and to encourage everyone – particularly health workers – to recognize that stopping sepsis is in their hands.